Leftover Thanksgiving stuffing waffles are a perfect (and easy) meal to make the day after Thanksgiving. 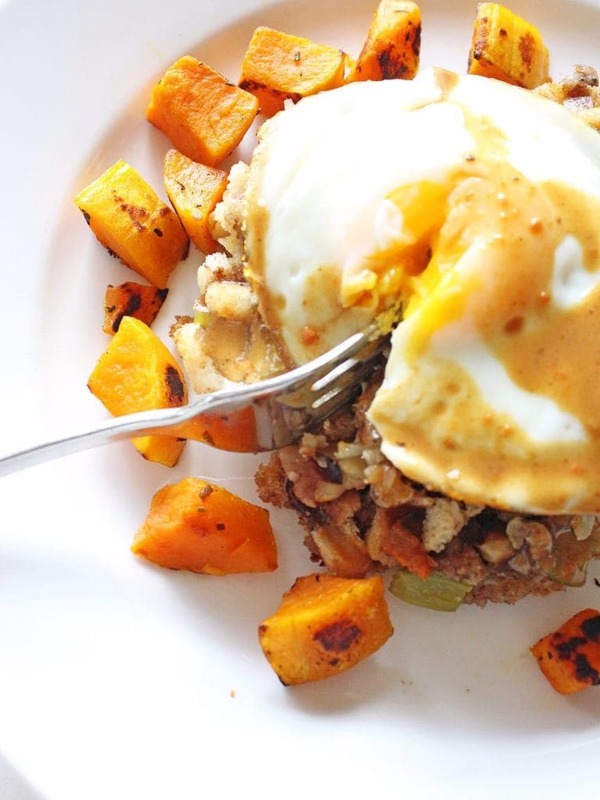 All you need is leftover stuffing, eggs and a waffle iron! Thanksgiving already?! This year is flying by and I want to preserve this food-centric holiday a little longer. So I took advantage of the leftovers and made stuffing waffles. Can this be true? Stuffing for breakfast? This can’t be true, it’s too good to be true. 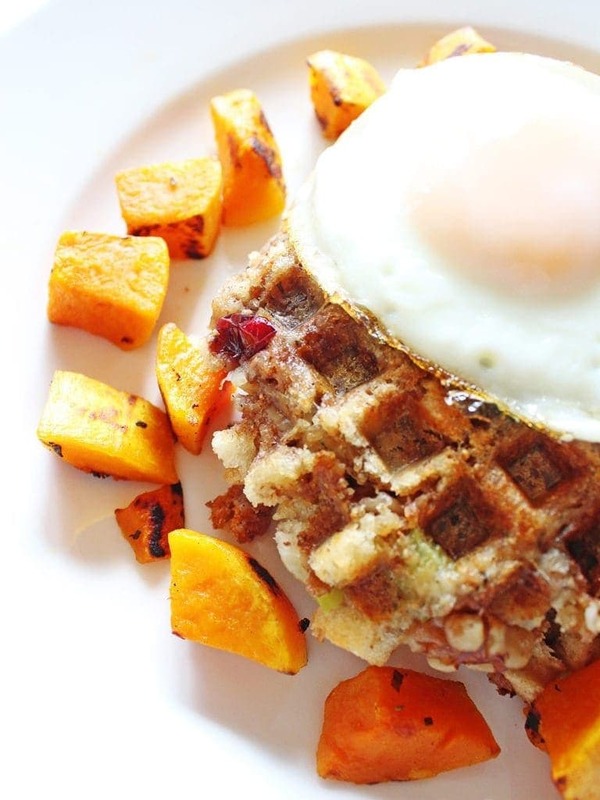 Stuffing in the form of waffles. Leslie Knope would be so proud. These waffles totally need an egg on top. And instead of syrup, I’m pouring gravy over this masterpiece. Lots and lots of gravy. Oh, and do we have leftover sweet potatoes? Because I’m totally making sweet potato hash and pouring gravy all over that too. That is the thought process of a gastronomic Thanksgiving genius. Okay, I’m exaggerating, but I must say these leftover stuffing waffles were incredible. I didn’t think I could eat more Thanksgiving food until I woke up the next morning and saw the leftover stuffing in the fridge. It didn’t hurt that these waffles were incredibly easy to make, which is just what you need to hear after a week of prepping for one meal. Am I right? Simply mix the stuffing with a couple eggs and chicken stock to get a good consistency to spread in the waffle iron. Then let the stuffing waffles bake in the iron and prepare an egg as desired (I prefer over easy). 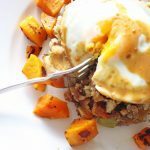 As for the sweet potato hash, that was honestly just leftover sweet potatoes warmed up in the skillet on the stove with butter, salt and pepper. Super fancy I know. The most important part of this leftover Thanksgiving masterpiece is the gravy. Don’t forget to warm up the gravy and pour it generously over the stack of stuffing waffles. And, if you’re really getting into it, add some cranberry sauce for some added Thanksgiving flavor. Now that’s how you do Thanksgiving leftovers. 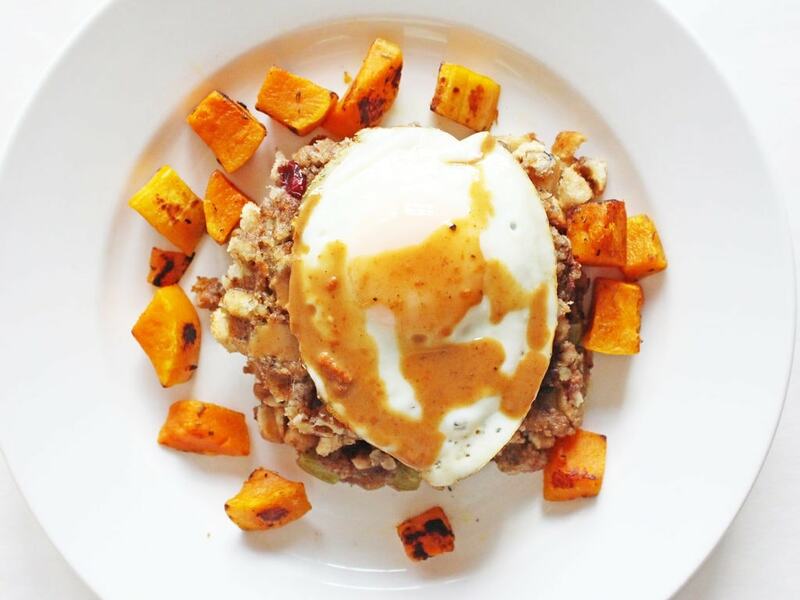 In a large bowl, stir together the leftover stuffing and 2 eggs until combined. Add 1/4 cup of chicken broth and mix until incorporated and moist. Scoop half of the stuffing mixture into the prepared waffle iron and spread evenly until the entire iron is covered with a thin layer of stuffing. Close the lid and let the waffle bake until crispy golden brown and the egg is cooked throughout. Transfer waffles to a serving plate and repeat the process with remaining stuffing. Prepare the other 2 eggs as desired (I chose over easy) and serve on top of the stuffing waffles. Pour warm gravy over the egg and stack of waffles. Serve immediately. Stuffing waffles work best with basic stuffing (without big chunks of vegetables or meat). These may take longer to bake than normal waffles because the egg has to be cooked throughout. The waffles are done when the outside is crispy brown. Inspired by Just a Taste.